Hometown hero Stella Donnelly returned on Friday, April 20 with Alex the Astronaut for their joint headline tour at Fremantle Arts Centre. They were joined by up and comer Jamilla for a great show, filled with laughs and good tunes. Jamilla opened up the show, a mix of her upbeat electronic style tracks, with a few songs just her and a guitar thrown in. She even played a stripped back version of her recent track Beautiful. 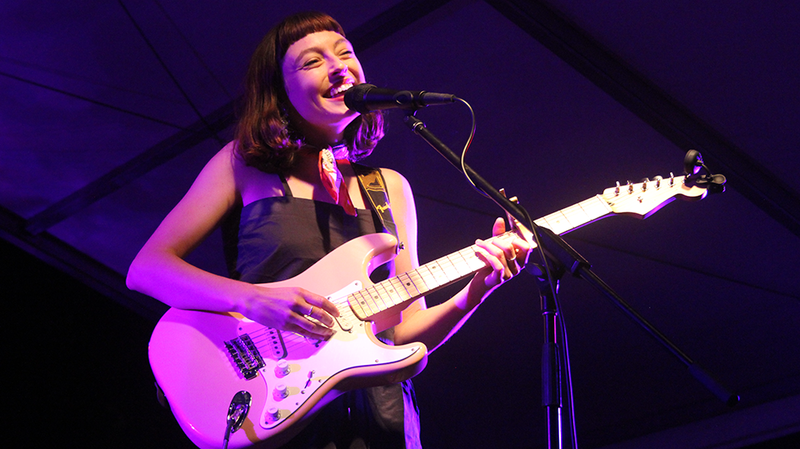 Stella Donnelly took to the stage next, and the Fremantle Arts Centre courtyard really felt like the perfect place for her to play. With everyone on picnic rugs and autumn leaves falling around the place, it felt like magic. Once again, Stella’s voice amazed from the first word of Grey, and despite having a mosquito unfortunately fly into her mouth she still recovered beautifully. 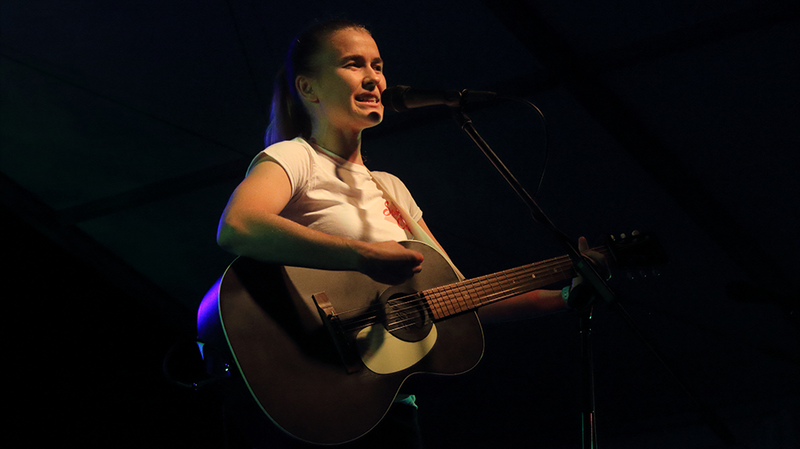 After playing a couple of unreleased tracks, she threw in a cover of a song from “A little unknown band,” The Beatles. I absolutely melted when she started singing Across The Universe, and this was the highlight of my night. After a content warning, Stella launched into Boys Will Be Boys, and you could hear a pin drop, the crowd was so silent. 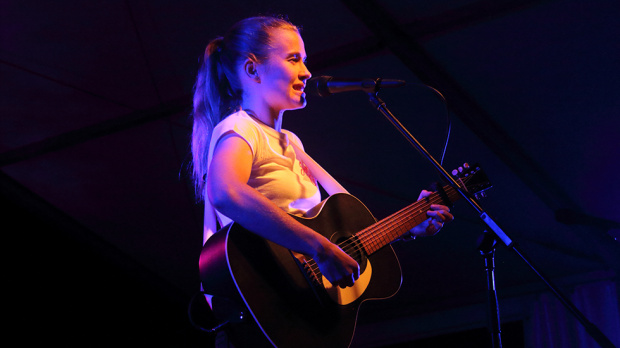 She then played recent release Talking, and a new song she had written about Fremantle and being homesick before she had even left. Stella finished her set with a run of songs from Thrush Metal, playing Mechanical Bull, much to the crowd’s delight, A Poem and Mean to Me, which always earns a cheer for the amazing vocal run. Stella’s set was, once again, amazing. She masterfully mixes her heavy content tracks with her well-crafted stories that are bound to make the audience laugh in between the songs. Alex the Astronaut took to the stage last and opened with her beautiful track William and Georgia, and followed up with What Sydney Looks Like In June. Alex was also great at telling stories and making the crowd laugh in between songs, although sometimes it felt a little like she was getting a little sidetracked. She got the crowd to clap along with her during Rockstar City, and invited Stella back onstage for a beautiful cover of Peter, Bjorn and John’s Young Folks. Their voices worked so well together, and it was a truly great cover. After reflecting on life, and losing people you love while you are young, she played the extremely personal Banksia, about a friend who died. Tears were welling in my eyes, and I could tell that they were perhaps welling in the eyes of others as well. She then brought the vibe back up with an amusing anecdote about meeting Paul Kelly before playing I Believe In Music. Hottest 100 hit and clear crowd favourite, Not Worth Hiding, was another beautiful moment. Already Home finished her set before inviting Stella back on stage for their ‘encore’ of Jimmy Eat World’s The Middle. It was great to see the two girls having so much fun, with Stella jumping and dancing around the stage. The audience were also encouraged to get up and dance as well, and it was a cheesy but definitely euphoric way to end the show.